Slyce: YOU WROTE A BOOK CALLED “BEAUTY”. WHAT IS THIS BOOK ABOUT? Beauty is a dark romance about a young girl who is abducted and lost to the world of human trafficking. After many years of horrific abuse, she gets a chance to be free, and take revenge on the man who brought so much pain and humiliation into her world. Slyce: IS THIS BOOK A STANDALONE OR A SERIES? Beauty is a standalone, but is also part of a multi author series. Six books, one theme, dark romance. Slyce: WHAT IS “BLAIRE’S WORLD”? Blaire’s World is the brain child of best-selling author, Anita Gray. Her gangland/mafia romance Blaire and Blai2e were international best sellers, and she decided break open this world to a wider audience by bringing together six authors to write their own dark romance themed novella in her imaginary world. We were given the option of using existing sub-characters from her novels, or creating brand spankin’ new characters that somehow relate to her novels. I went for the latter. Slyce: HAVE YOU EVER PUBLISHED ANY OTHER NOVELS? 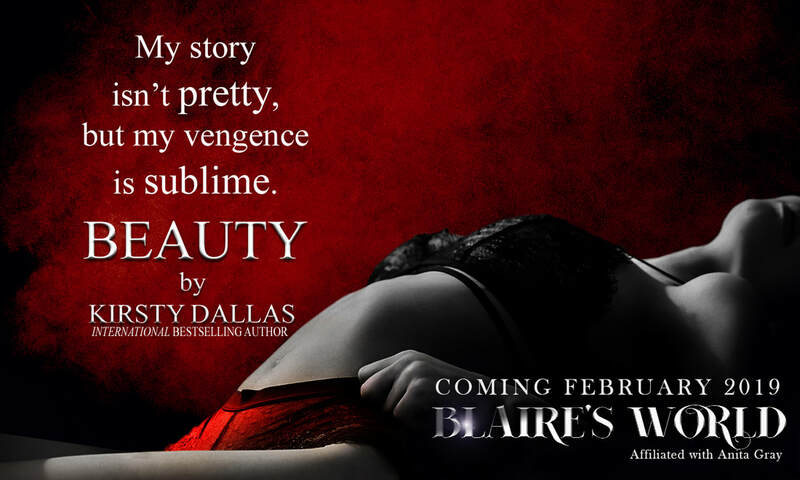 Beauty will be book twelve for me. A large portion of my novels to date are made up from the Mercy’s Series, a contemporary romance series that tackles the subject of violence against women. Slyce: WHAT’S NEXT FOR KIRSTY DALLAS? Slyce: DO YOU FEEL A NEW AUTHOR SHOULD HAVE A TEAM? If you mean a street team, no, it’s not necessary. And honestly, trying to build a street team these days is super challenging. It requires a stack of attention and moderation, and honestly, as a new writer you should really just focus on writing. Get as many words down as possible, pump a few books out to create a back-catalogue and concentrate on marketing and networking. Slyce: HOW DID YOU FEEL WHEN YOU FIRST HELD YOUR PUBLISHED COPY IN YOUR HAND? It was super surreal, and humbling. I felt like I’d created my very own stamp on this world…something that would not disappear and would stick around long after I’m gone. That’s a pretty awe-inspiring moment. Slyce: NAME TWO OF THE MAIN CHARACTERS IN THIS BOOK? The first paperback novel of my own that I held in my hands was Saving Ella: Mercy’s Angels Book 1. The male protagonist is Jaxon Carter, and the female is Ella Munroe. Ella has been living on the streets and stumbles into a women’s shelter during a snow storm. Jaxon Carter’s mother, Mercy, owns the shelter; hence the series name “Mercy’s Angels”. Slyce: IN WHAT CITY DOES THIS STORY TAKE PLACE? It’s a quaint little fictional town in the U.S, called Claymont. Slyce: WHAT WAS ONE OF THE BIGGEST MISTAKES YOU’VE MADE AS A NEW AUTHOR? Slyce: WHAT MOTIVATES YOU TO WRITE? My motivation fluctuates dramatically from one day to the next, and I never sit down and write unless I’m feeling it. So I can go days without even thinking about my current WIP. To help activate that static motivation I usually listen to music. Music seems to just lift my soul and get me in the mood to create. Slyce: WHAT MESSAGE ARE YOU TRYING TO GET OUT TO YOU READERS? While all my books have pretty serious topics – violence against women, human trafficking, drugs and addiction, cancer – I’m not necessarily trying to push messages into the minds of my readers. I really just want the reader to be transported away from reality for a little while, and if they finish the book and get something more meaningful from it, then that’s absolutely a bonus! Slyce: WHERE CAN OUR VIEWERS PURCHASE YOUR BOOKS? The ‘shop now’ button on my Facebook profile – Kirsty Dallas Author – from my website which will direct you to a sales platform of your choice (www.kirstydallasauthor.com), Amazon, iBooks, Nook, Kobo and the Book Depository. Little Gnome bookstore in Brisbane, and Books In Style in Sydney. Slyce: HAVE YOU EVER DONE A BLOG TALK RADIO? I have not, and I think I’d be too nervous to. Although, I’m calling 2019 my year of ‘trying new things’…so, maybe one day. Slyce: WHAT DOES THE PHRASE “LEARN THE CRAFT” MEAN? Exactly what it says, learn the craft. You don’t just pick up a pen and become a writer, it’s a craft that’s learned, developed and always evolving. To be a good writer need to be open to long hours of just writing (novels, blogs, journals, ANYTHING…), listening and taking healthy criticism. Slyce: WHAT PAST AND PRESENT AUTHORS HAVE HAD AN INFLUENCE ON YOU? Oh, that’s tough. So many authors have influenced and inspired me. The almighty and powerful paranormal romance trio Kresley Cole, Gena Showalter and J. R Ward, I obsessed on these ladies when I first started writing. I loved the passion in their words, and the subtly mixed comedic elements in their novels, particularly in Showalter’s and Cole’s writing. Slyce: DO YOU WRITE FOR THE PLEASURE OR PROFIT? I haven’t made a profit in two years, so I’m definitely here for the passion. I wrote my first novel at 14 and it sits in a drawer at home on that old school printer paper that has the tracking holes down both sides. I’ve been writing my whole life simply for the passion. Thanks for having me in the Interrogation Room!! Want exclusive access to Beauty before everyone else? Sign up to my newsletter before 29th January, 2019 and get the first chapter free. The entire Mercy's Angels Series is now available in KINDLE UNLIMITED. That's over 400,000 words in five full length novels that you can read for free in the KU program. 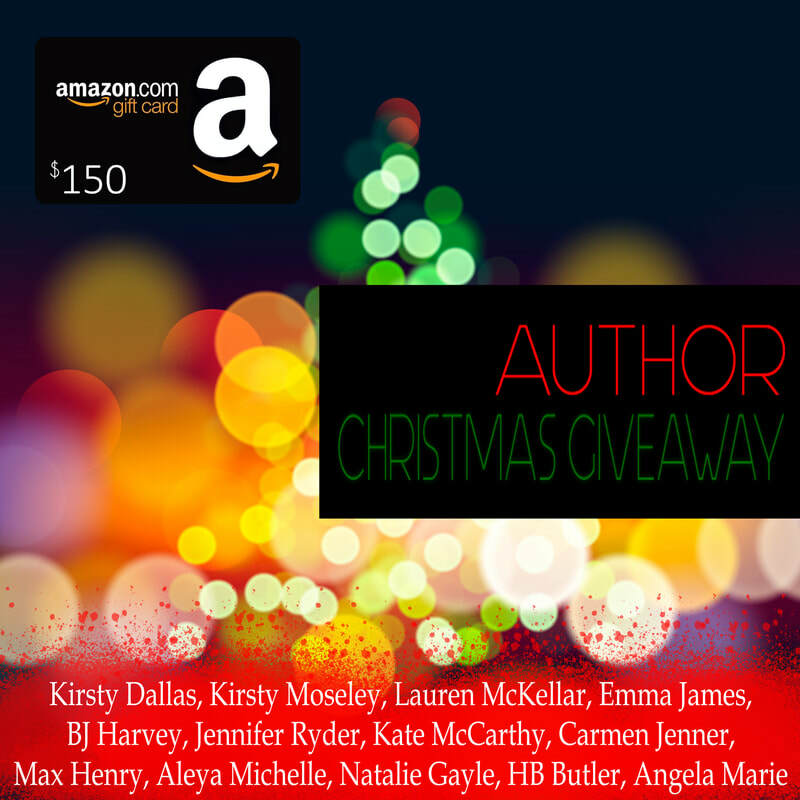 As a way to thank all our loyal and wonderful readers, myself and a few of my author besties have come together to give one lucky reader the chance to win a $150 Amazon Giftcard this Christmas. To enter, follow the instructions below. For bonus entry points be sure to check out the extra links you can follow to give you more chances to win!